My most treasured ornaments are not ones store bought, but those made by family and friends. Pass along the tradition and make a few for yourself and others! These two "icicles" are easy peasie. Big and bold, they will be add a colorful dash to your Christmas tree. 1. Hot glue the Smoothfoam™ balls together. Add a dot to the center of the 3" ball and push the 2" ball in place. At the opposite side of the 2" ball, add a dot of hot glue and push the 1.5" ball in place. Repeat procedure with the 1" ball. Allow to cool. 2. Cut tissue paper into squares and rectangles of assorted sizes. They should be no larger than 1" square. 3. Pour some Mod Podge® onto a piece of foil. Cut a sheet of foil and roll up the sides to make a dish for the Mod Podge®. Pour in a small amount of Mod Podge™. Dip your brush into it and paint a thin layer onto the ornament base. Stick a piece of tissue paper to it and push into place with the brush. Keep going until the entire ornament base is covered. You may need a second layer if some areas look thin. 4. Allow ornament base to dry thoroughly. Place the form on a clean sheet of foil and allow to dry. 5. At the top center of the ornament base, push in the eye pin. For Blue Icicle: Punch out 2 dozen snowflakes. Pick up a sequin with the straight pin and attach a snowflake to the ornament base. 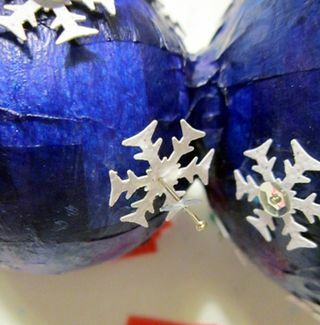 Cover the entire ornament, leaving some space between each snowflake. For Red Icicle: Add glue dots to the surface of the ornament. Apply larger ones toward the top and small ones at the tip. Shake on glitter. Brush off excess. 7. Tie on the ribbon. Thread ribbon through the eye, bring ends even and knot together.